BIOMONITOR makes diagnosis a pleasure ! (1) Pulse rate and rhythm; (2) Respiration rate and rhythm ; (3) Temperature ; 4) Systolic and Diastolic blood pressures; and (5) Heart sounds. An Opto-electonic finger sensor is used for pulse rate monitoring. 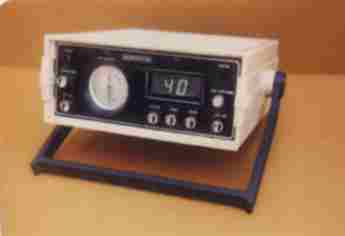 The Pulse rhythm is indicated by LED flashes/beats while the rate is displayed on a digital meter. An elastic sensor strapped on the abdomen / chest area monitors respiration rhythm and rate. A Thermal sensor kept in the mouth/arm-pit is used to monitor temperature. Systolic and Diastolic blood pressures are obtained using an electronic adaptation of the RIVA-ROCCI principle. Heart sounds can be heard loud and clear by keeping a transducer on the patient’s chest. Fast and simple to use, the Biomonitor is housed in a compact briefcase that can be carried anywhere with ease .